For my fantastic bike and the service I received. Buying a bike online and only relying on photos can be a risk, however my Bike I bought from you Andy was everything you described and more, it is in fantastic condition. The attention to detail with all paperwork and even stamping the service book for the sale service was particularly impressive. Andy you put my mind at rest every step of the way, and made the process of buying online and by phone painless. The price of the bike was very good, as Ive seen other bandits more expensive than mine, and my bike is a country mile better than the rest, in condition and service history, ooh and all the after market goodies. Anyway Andy thank you again absolutely fantastic. What can I say, your customer service is second to none. Fabulous service from the moment I arrived to the moment I left. Glad I chose Youles to buy my new Triumph. Please pass on my remarks to your team. Looking forward to my next visit. My name is Margaret Davies and I would like to complement all your staff at Youles Motorcycles, Blackburn, and to tell you how fantastic they all are. My dealings with your shop started on the 8th August 2016. I wanted to buy my husband a Triumph Bonneville T120 red and silver as a surprise for his 70th birthday in September. I had to recruit a very good friend of ours Mr David Ginsberg to assist me as it was impossible for me to do it on my own, he did all the arranging and paperwork, I put the money he needed into his bank account, David dealt with Mr David Eckersall, a very nice guy. Friday 9th September was delivery day, the date and time was so important, no-one in our family new about this and as they call on a regular basis it was mega pressure, even his ex fiancé called but didn’t stop long thank god. At about 2.30pm/2.45pm your delivery driver Chris rang the door bell, Stewart my husband was making a drink and shouted “I will get it”, David and myself followed, Chris did a brilliant job, he told Stewart he had a surprise for him, the air was alive with emotion, BRILLIANT, the day after we went to your Blackburn store to buy some accessories, David showed us round your store and introduced us to his staff, the store and staff where absolutely superb and I am so glad to have had dealings with them, of course all our biker friends will be told. May I say a massive big THANK YOU to all concerned. I was at the bar of the Bay View Hotel in Port Erin lat Tuesday when the guy next to me turned to me and said, "I've just seen your picture on Facebook". Turns out that he'd hired a Tr. Tiger from you and been shown the website. Fair took me by surprise - it seems that on the Island Youles Rules. Thanks for your help with the bike. It didn't miss a beat and now that I've returned, I'll be going through the process of importation. Could be interesting for you to know how it's done, especially with the price differential being what it is! When Phil gets back please pass on my best. Our paths didn't cross on the Island. Hello, I have just had my first service on my Triumph Bonneville Black at your dealers at Blackburn, Youles. The service I received was exceptional, having previously owned Harley's I was very pleasantly surprised by the high standard and professionalism. Everybody knew my name, I was taken through the service details. The bike was ready early, then the mechanic went through everything he had done, he also washed her and wheeled her out onto the car park. Just a short note of appreciation for the service I received from Mick and Anna during my visit yesterday,please thank them on my behalf and tell Mick that the strapping holding the 'old' pannier lids onto the rear carrier worked a treat.In fact it was so strong it reminded me of an old advert for wallpaper paste where a car's roof was papered over and then the car lifted from a hook secured from the paper! (didn't try this with the bike!!). All the best for Xmas and the New Year,particularly with your new arrival.she will be the 'apple of her Dad's eye' no doubting that! Thanks for photos and well what can I say. t' bird is a different bird to one I brought to you. I am having to learn to ride again an am looking forward to my next trip. Bring it on. Thanks again to your team. I was more than happy with the service I received, James knowledge of the motorcycle was spot on and he was aware what I was looking for from my first visit to the shop. We had a few changes by myself which James sorted well and kept me up to speed via email on delivery dates on accessories etc. The 500 mile service was easy to arrange with a few adjustments and additions discussed with Gary who was most helpful and the chat with the mechanic when picking the bike up is a great touch for any questions the rider may have. It's my 3rd motorcycle from your company and I wouldn't hesitate to recommend Youles motorcycles to other motorcyclist. A huge thank you to Philip ( and his son). Making DGR in Manchester happen. And coming to my aid with a temporary fix for the broken clutch lever on my Ducati and his son for adjusting the lever and taping it up. A true biker in the making! Always try to come to the aid of another biker in distress. If there is a moral to my tale of woe its to listen to medical advice and avoid riding!! At least until full power is resumed to the left arm. Sorry I wasn't around to meet you at Albert's shed on Sunday ( Dan forwarded me your email address ) The boys were continuing onto Oulton Park so were keen to drop me off! We had such an incredible day, already dying to participate again next year! Hi I picked up my new bike today (speed triple your ex demo model) and would like to say a big thank you too the team that prepared it for sale and especially, Steve the salesman I dealt with who made the whole process a very easy and smooth transaction. Well done. see you when its due the service. I would just to say thanks to all, for the great service I received, when I recently brought my Thunderbird to you for its service, I've only had my bike for a year, so it is the 1st time I have used your services for maintenance, and I will definitely be back. The way in which all your staff paid an interest and how well Carl the technician, kept me informed of everything on my back, in dealing with a small pebble which had gotten trapped in the rear pulley, really made me feel comfortable. I did not buy my bike from you, but that was only because you didn't have 1 available at the time, and I didn't want to wait! But the friendliness and professionalism of all your staff, would certainly encourage me to purchase a future bike, through your branch. Thanks all once again. Massive thankyou Dave, Craig & Rob for all your help. Had an amazing ride home :) much more grunt than I expected too :) Possibly happiest day ever! Still smiling even though I'm at work now!!! Thanks again Team Triumph Bburn, you all rock!!! a little belated but we would like to tell what a great dealership you have in Youles Motorcycles Blackburn Lancs. We purchased a brand new Triumph Thruxton in Nov 14 and the service we had from the moment we walked through the door was outstanding. My wife works for British Airways in customer services so is also critical of how we are dealt with but even she was impressed. Names to single out, Jason who did most of the work, but also David who took us through everything when we collected the bike, which by the way is amazing! Many thanks for all your help in the purchase of this bike. You have kept me informed at every stage. I have too much work on today and also too much grit/salt put down on the roads last night to go for a run. What a great looking bike & the backrest will certainly help my dodgy back also. I hope you are happy with the fazer, I have never run it in the winter as only used in summer. I also followed the 2 brothers who had it before me and only used fully synefetic oil in the engine. What’s your managers name as Im going to drop him a note regarding your 1st class customer service. Hi William I spoke to you last week regarding a broken gear lever on my 2011 speed triple ,I took the bike in on Saturday and the workshop was quiet so they fitted the lever there and then for me . I would just like to thank you for managing to get the part replaced under warranty I was hoping I could thank you in person for on Tuesday when I came in to collect the bike. The workshop also checked over my bike and printed me a new number plate which I needed I am very pleased with the service I have received from you all thanks again. I just wanted to say a big thank you to you and your team for the way you dealt with me, and my problem recently. staff I dealt with - the lads on the service desk and the technician were really helpful and first class in every way. Please thank them. From the very first contact I have had with your company I have been most impressed and although I do not plan to 'Diesel' up again I am sure I can look forward to excellent service in the future. Good Morning Mr Moore. I understand you are Head of Aftersales for Triumph and for that reason I am dropping you a quick e-mail. Having been the owner of three consecutive BMW GS’s I made a switch two years ago to the Triumph Explorer. Living in Manchester I dealt with Philip Youles (Manchester branch) and found the initial advice and explanation of options well-presented and instrumental in my final decision to move to the Triumph. All was well with the world and I was a very happy motorcyclist and then recently my Explorer had a major mechanical problem that needed the help and expertise of the same dealer. To cut a rather long story short, I have just been the recipient of what can only be described as service on a level I have never experienced previously at any other dealership and service that has made my decision for which bike I will choose next, a forgone conclusion. It will again be a Triumph. I would like to go on record and say that the many people at Phillip Youles (not least Philip himself) have made a lasting impression to such an extent that I find for the first time in thirty years of buying and riding motorcycles I wanted to let the people they represent know what great job they are doing. My thanks to all at Philip Youles and also to a number of guys at Triumph who I believe have made my pending ride to the East Med region possible. Many thanks, I have just received your letter advising me that you have been unable to contact me by phone following the recent service on my Street Triple carried out at Blackburn. Please do not concern yourselves that you have been unable to speak to me regarding the above – had it not been satisfactory you most certainly would already know. Being customer focussed I understand exactly the need to ensure yours are happy. I would like to say that I have had nothing but exemplary service and attention to detail from the staff at Blackburn. Whether it be from Sales, Parts/Service, or the Workshop your colleagues always strive to give the best possible attention to all their customers and are a credit to your organisation. I would have no hesitation in recommending Youles Motorcycles, Blackburn, to anyone looking to buy a Triumph Motorcycle or associated service. Please feel free to use me as a ‘testimonial’ customer, although I am sure you must have many. RE: Tiger 800 Heated Grips Fault on (VRN) BXZ 4756 Philip Youles (Blackburn) giving excellent customer service I have had an on going fault with the heated grips on my bike since it was first delivered, much to my dissatisfaction. lt's a shame that the fault has only been rectified by a home move (and hence a dealer change). The story at dealer I I've been a biker for some years now, in my younger days my (financial) choices were limited to the second hand Japanese models. I'd read a very inspiring article in a bike magazine some years ago about the revival of Triumph, particularly the 3-cylinder developments which really drew me towards the brand. My first Triumph model was a second hand Tiger (T) 1050, a bike which I really enjoyed. When I heard about the T800 I was in a position to purchase a new machine. I felt that the 800 was made for me; lower, lighter and easier to handle. I pre-ordered my machine as soon as I could. This was my first ever new bike with a lot of extra accessories- all of which I had saved hard for. I chose to get the otficial Triumph accessories believing that if Triumph can make great bikes then their accessories must follow suit. Surely the triumph accessories would also give the best function and fit whilst retaining the warranty. When the bike arrived (after a short factory delay) the dealer was unable to fit all the accessories on delivery- omitting the heated grips. I accepted this as I was keen to get the bike after the two month delay having already had to trade my bike in early. The heated grips were then fitted around two months later when the dealer had the workshop time. By the time the grips were fitted winter was approaching which was mild that year. Due to work commitments I only used the bike on shorter trips and was also riding another bike. I used the heated grips a few times but on no extended trips. I'd found the heat function to be poor; in fact I often couldn't tell if they were even on. ln early may the next year I rode to the North West 2OO races, this was a two hour ride in poor weather. I found the heat from the grips to be virtually non existent- which gave a wholly unpleasant riding e*peri-ence. (Note: I also had Triumph hand guards fitted). On my dealer visit I mentioned this and the issue was to be investigated at the next service and was noted on the worksheet. On picking the bike following the service up the guy on the Triumph service desk took me into the workshop to my bike where hb turned the grips on and demonstrated how they were heating up- they felt slighgy waln-to the bare hand (therefore minimal etfect through gloves). I explained how they offered no heat function but he said they either worked or not- and in this case as they were warm they were working. When I further questioned this he then suggested that I must be wearing wrong gloves?! Note: the grips were warm to the bare hand and no test ride had been completed to confirm function. well I was hugely otfended the dealer attitude. This machine was a huge investment for me- I had fully specified it with a host of accessories and I expect it to be fit for purpose t ajso expected triumph to better design their accessories. I am not exactly new to motorcycling- and my previous T1050 had heated grips and hand guards- a setup which was so effective t'd replicated it my new bike. ln fact I believe the heated grips themselves were the same as on the T1050 with only the switch unit being ditferent. And the Atpinestars gloves I used on my T800 were the same as I always wore on my T1050. Following a stint of cold rides on my TSOO I had to buy a pair of full winter gloves (Triumph branded Alpinestars) which made me question why I'd bought heated grips and hand guards! After that dealer insult I headed to the forums for further support. The general consensus of opinion at the time was that the grips did not offer the best heat performance but there were no reported switch faults. The advice was to go back to the dealer. On the next dealer visit I again mentioned the issue and I was told they would contact Triumph to further investigate, which I assume never happened as I never heard back.... (l suspected r was being fobbed otf). I did receive a follow up service call from the dealer following a service where I spoke of my frustration and was again assured they would resolve the issue nothing heard back from that either' ln the meantime I continued to enjoy my bike (having bought winter gloves)' My grips were much to the amusement my GSg00 friend- who also test rode my bike and referred to them as free zq grips. I'd. bought the bike to ride through all weathers- a shame such a smaii issue ruined my riding (time) and pleasure. I even invested in an infra-red thermometer to measure the grips performance and to attempt to prove to my dealer that there was a fault' I will also note here that during this time two of my friends also bought T800 machines and both had Oxford'grips fitted- which gave them warm hands at a lower price! Service at Youle,f,l,..... Fast forward as few months and I had given up on the original dealer' I did consider contacting Triumph direct but I was aware the systems are set up most effectively to operate through the dealer network. Given a poor dealer response my expectations from Triumph head office were very low. My circumstances then changed and I moved to the Preston area' (By this time I'd had the bike for almost two years- and it had been fully serviced bY the dealer). once settled I then sought out my local dealer (Philip Youles in_ Blackburn) and paid a visit to book my yearly service. when booking in I met Mark on the service desk and explained in" grips issue (l was aware that the warranty is a year for accessories out jiven in"y had never functioned correctly thought I would ask their advice). The bike went in for its service and a function check of grips. initially the gfps were found to be coming on in the workshop so the technician (Carl) and Mark had a chat and the bike was taken on a test ride. immediately the mechanic saw that the grips were faulty. (l'll note here that Youles listened to the fault as I had described and trusted me)' On the bikes return I was introduced to Carl who explained he suspected a faulty switch or relay. He was extremely informaliy9 and explained what they had done to my bike and the tests performed. 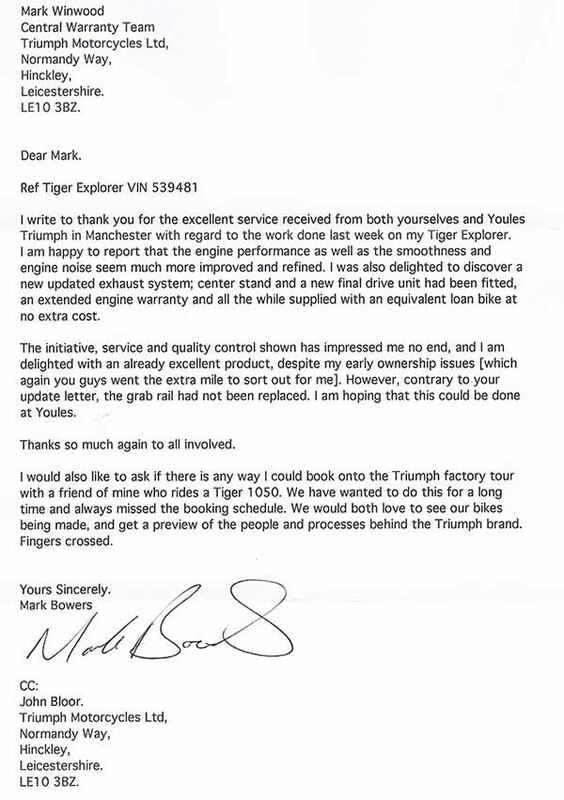 we then chatted to Mark in service who said he would contact Triumph to try and chase a goodwill claim' 3 By this time I'd lost a lot of faith in triumph, I was unable to control the grips occasionally having some heat. ln the dark the red indicator light (which I couldn't switch otf) had become a reminder of 8150 wasted. The only way to control the grips was to remove the fuse, which once the bike was packed with luggage was ditficult to access. Given lack of dealer assistance my strategy was to get the bike serviced locally and use the money saved over a non-dealer service to pay for aftermarket grips to be fitted myself (the faulty grips would have been packaged and sent to Mr Bloor). Back to the dealer- Mark had contacted me to say they would look at the grips. A new switch and relay were ordered and the bike booked in. Carl suspected the switch unit most likely at fault and changed it out- which cured the fault. Such a simple fix which had taken just a few minutes but had given me years of hassle! Many thanks to Mark and Carl at Youles for their time and perseverance. They listened to me and their customer service was impeccable. I honestly cannot believe why I had to move house (and dealer) for this fault to be fixed- how can the service offered by your dealers vary so much? The service by the guys at Youles restores some of my faith within the Triumph brand. Had I have not have moved dealer I would not of considered another Triumph machine- such a small fault really ruined my rider pleasure for so long and ignoring a complaint infuriates me. Given the amount of competition in the motorcycle industry and with the accessory and servicing markets being so valuable I had greater expectations of the initial aftersales support. This is a quick thank you to all the staff at the Blackburn showroom especially Royce on the purchase of my new bike. I called in a few weeks back just for a look around. I spotted the bike I liked and Royce answered all my questions and was totally helpful in the transaction of the bike and nothing was too much trouble. Thank you for your customer service the other day, it’s nice to go into a shop and not be pressured into buying something when you’re not ready to. Good to speak to someone who is actually interested in the goods they are actually selling too. I’m emailing because I’d like to know what finance options are available…do Triumph do finance? If so how does it work and what options are there. Just weighing up the best way to go about the purchase of a Tiger in the next few months. Many thanks for the photo! We had nice trip home on the Rockets, no rain at all and no problems whatsoever. Spoke to Chris yesterday and called just to say thanks for the splendid service and hospitality shown to us. Great job! I’ve ordered a Triumph alarm and standard grips for the bike through the service dept, I’m removing the Oxford grips and will eventually replace with Triumph in due course. I thought I owed you massive thanks for the Street Triple and getting it sorted so easily. As you know I’ve been trying a range of bikes Triumphs, KTMs and Hondas over the last couple of years ever dreaming and trying to sort out which one fits. All throughout the process you and Youles have trod that clever balance between friendliness and professionalism. You have the fine ability to listen to my excitable ramblings whilst helping steer me towards the right bike. The 800 wasn’t nimble enough and the Daytona still makes me smile but I don’t have enough self control to keep out of mischief. I entered Youles looking towards a second hand Sprint, which I like and would recommend, but had reservations as it’s still a bit big for my use. The next thing I knew I was most of the way through buying a Street Triple. I’m pretty sceptical of anyone trying to sell me anything so I’m very impressed at how smooth you made the whole process. I still was expecting obstacles to pop up until the last minute but instead the whole process was straightforward and a pleasure. I’ve never had a new bike before so to go through the process and pampering was an eye opener. Having never ridden the Street Triple before once moving it exceeded my expectations. I filtered through the traffic through the centre of Manchester with ease and confidence. I’ve kept the speed right down to run it in properly and stuck to the small lanes around Knutsford and Pickmere and Delamere. It was lovely. Planted, easy to manoeuvre, it flows round corners using small body movements without pressure on the bars. It even sounds good at low revs, when with most new bikes you just want to get rid of that standard exhaust. After the KTM most bikes feel flumpy but the Speed Triple is excellent and it feels like its natural habitat is in the quiet evening B roads. Its engine is amazing being easy to rid at 30mph rumbling along and it is solid enough for motorway use to get to a new play area. All in all a very rewarding experience and I can’t believe I’ve landed on the bike that suits me so well and it such a reasonable price. I didn’t think I’d ever choose to own a new bike but I’ve been more than pleased that it feels like it’s a bargain. It has prompted a few discussions at work and I’ve been recommending Youles to all I’ve come across. I’ve told my ex boss to try one of your retro Triumphs and our Engineering RE has swapped his target bike to a Street Triple and has started sewing the seeds to his wife. Another one of the great immeasurable but hugely important factors of influence was demonstrated by the level of passion and pride shown by a customer outside your showroom. The guy had just picked up a new Street Triple and I was getting off my bike to go into Youles. He had just been left some money from a relative passing away & like me thought he would never own a new bike. He was so proud of the British brand and the link to the special money. Thanks very much, keep up the good work these bikes are more than machines. p.s. I’ve had the Street Triple for 3 evenings now & done 350 very happy miles and will hopefully get my 500 in before the week is out. just wanted to say thanks for taking the time to chat on Saturday. I appreciated your advice on bikes (and backs!) and kind offer of a test ride in the future. Best wishes from the Lakes. Thanks very much for the photographs. Anita is very pleased with the pictures and of course the K1600. Thanks to you and the team at Philip Youles from start to finish, you have made it all run smoothly. Very good customer service, and a friendly bunch. My journey home to Chessington was great, (albeit traffic added more time). I arrived back home at 5.45pm, only stopping twice to top up the petrol, and then to fill up the tank on the final part of the journey. Great bike, and very pleased with it. 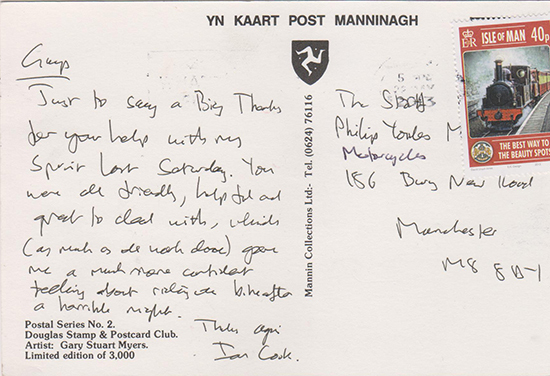 I am writing to you to say thanks for the customer service we received last week. My name is Callum Oliver and last week as a reward for working well at school I chose to look around local bike motorbike shops. As we arrived at your shop we were greeted by a member of staff, who explained what some of the bikes were and what they did and also showed us the workshop. He supplied lots of brochures and offerred an invitation to the open night on Thursday. Again I would like to say thanks on behalf off me and my teacher. Thanks for your letter regarding the service of my bike PN05 FSK. Everything was great as always with the service, I couldn’t fault it – thank you. I have just bought a Tiger Explorer from your Blackburn operation and what I am about to tell you of my experience will (hopefully) make you proud. Two weeks ago I talked my family into a drive out to your showroom in Blackburn much to the displeasure of Lorraine (wife) and Luke (son). We were cheerfully greeted by a young man (Jason Noblet) who could not do enough for me (or my family). Every question I asked about the bike was responded to with clear and concise answers. We had a coffee, tour of the showroom and a very interesting talk about your company and the Triumph brand.So far I am impressed, Jason then invites Lorraine and Luke to get involved with adding accessories to the Triumph much to their pleasure (no longer a boring day out doing dads thing) I arranged a test ride for the following week. Driving home my family were almost as exited as I was, the thing is my family were involved, they felt valued not ignored, Jason spoke to my wife and son as much as he spoke to me. Things cannot get any better or could they? I test rode the Explorer and I was hooked. Jason advised and guided me through the process of buying the bike then stuck a notice on the bike with my name on it (nice one) I was introduced to Dave who again could not do enough for me, he advised me on different options and insurance. Wulley at the service desk was only to pleased to do as much as he can to please me. What a team to be proud of. I picked the bike up on Saturday and everybody came up to me and thanked me for buying at Youles and wished me well, I had my photo taken and received a Triumph T-shirt, what an experience. Thank you Mr Youles, your staff at Blackburn are excellent and I hope you are proud of them, I am. I will be promoting your business to family and friends and I wish you the very best for you and your team. Well, what can I say- I requested that Mick do the job for me as I know from old that he always does a great job and treats your customers motorcycles as if they were his own- a rare thing these days!! After Mick had completed the service he spent time talking me through exactly what he had done and the reasons for doing them. A very professional approach in my book. Needless to say, the bike was a different animal !!! In terms of value for money- I have no reservation in recommending you to other biking mates, a couple of which run Trumpets. Overall well pleased – long may it continue. Ps please pass on my thanks to Mick. My name is Martin Robinson , and I recently had my motorcycle serviced with you, I am sorry you could not get hold of me by telephone, but I was on a biking holiday to France and have just got back. My bike registration was xxxxxxxx, a Triumph Speed Triple. I would like to say that the service was excellent, from start to finish it was exactly what i would expect and more from your company, on collection my bike was ready on time, was cleaned and ready to go, and has been faultless on my recent trip. All people involved were very helpful and nothing was to much for anybody from start to finish. Keep up the good work and Thankyou. I would just like to say a personal thanks for all the help and support Blackburn has given and offered me over the purchase and warranty work carried out on my bike. The staff have all been outstanding and are a credit to the company down to the last man and women. I am sorry I am returning to Suffolk and will not be using your services again but I wish you and the company all the best for the future. Pass on my thanks to all. I will pop in if ever up this way. I would just like to say thanks for making my transition into the world of Triumph motorbikes such a painless and pleasurable experience. I had been looking to buy myself a new machine after leaving the Army having served 25 years, and initially went to a nearby BMW dealer. The sales staff there seemed more interested in selling us a finance plan than respecting our wishes and choice of motorbike. Stepping into Triumph Blackburn was a completely different experience, and with help and advice from David Eckersall, my wife and I soon had our sights on a shiny Tiger 1050. Everything about our experience with David seemed just right, and at no point did we feel that we were being pushed to buy something we didnt want. We eventually had in our possession a 2010 plate Tiger 1050, with plenty of added extras, and I dont think we have stopped smiling since hearing that awesome triple tone, and the distinct overrun sound as I let off the throttle. A slight hiccup though, as the bike required new brake disks due to warping. Again, this couldnt have been a smoother operation. I brought the bike in, it was checked over by one of your engineers, disks ordered and fitted within a week, simples! I recently did a couple of You Tube Videos of my new Bonnie, purchased from you. Here’s the link of the latest, which one viewer asked to see, re the accessorie pack. Just a bit of fun really, but hopefully it promotes the Triumph Bonneville and also your dealership!! I am a proud Brit and believe in the brand, it deserves to do well.